U.S. Geological Survey (USGS) scientists and collaborators discovered that long-wave ultraviolet (UV) light directed at the wings of bats with white-nose syndrome (WNS) produced points of distinctive orange-yellow fluorescence. The orange-yellow glow corresponds directly with microscopic skin lesions that define the current "gold standard" for diagnosing WNS. White-nose syndrome, a fungal disease caused by the fungus Pseudogymnoascus destructans (Pd), has killed millions of bats in North America since it was first diagnosed in New York in 2007. This application of UV light is the first screening method for WNS that can provide immediate 'on-site' information regarding WNS in bats. WNS cannot be reliably identified with visual inspection and the only way to confirm presence of disease has been to euthanize the bats and send them to a laboratory for testing. In an effort to evaluate UV light as a non-fatal WNS screening method, 168 bats submitted for diagnostic testing from 2009 through spring 2012 had their wings examined with both UV light and microscopically to determine if they had WNS. 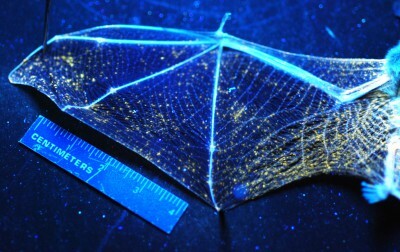 Comparing the results of histology and UV light showed that 98.8-percent of bats with orange-yellow wing fluorescence (80) under UV light were confirmed positive for WNS microscopically, and 100-percent of the 88 bats that were fluorescent negative were also microscopically negative. Ultraviolet light was then used to target areas of fluorescence for biopsy and these 4mm samples contained microscopic erosions diagnostic for WNS. Wing biopsies guided by UV fluorescence were then used in the field to evaluate WNS status in 62 bats during capture-and-release as they were leaving hibernacula in the Czech Republic during 2012. Of 22 biopsies that were taken from points of fluorescence on the wing, 95.5-percent were also microscopically positive for WNS. The 40 biopsies from non-fluorescent areas of wing were all negative for WNS. Combining research from two continents demonstrates that this UV screening tool for WNS has broad geographic and species applicability with great reliability and minimal harm to bats. The use of UV fluorescence will help wildlife managers and researchers more quickly track the spread of this disease with an 'on-site' screening tool and it will be particularly helpful for use in populations of endangered bats that are federally protected. This WNS screening tool can also provide a way to look at the dynamics and intensity of infection over time in live bats and could be used to evaluate the potential response of bats to medical treatment. Funding for this work was provided by the USGS Wildlife: Terrestrial and Endangered Resources Program and the Contaminant Biology Program. Nonlethal screening of bat-wing skin with the use of ultraviolet fluorescence to detect lesions indicative of white-nose syndrome: Journal of Wildlife Diseases, 2014, v. 50, no. 3, p. 566-573, doi:10.7589/2014-03-058.